Our family-owned law firm is not only home to our two partners, but it is also home to Teresa A. Cebulski, who is a sister to our partners. She is the office and accounts manager and is an integral part of our legal team. 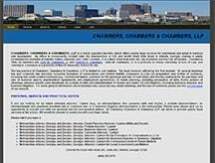 Whether you are currently a business owner involved in a legal dispute, are considering starting a new business in the Atlanta metropolitan area or are an individual in need of estate planning guidance, the team at Chambers Chambers & Chambers, LLP, will strive to answer all of your legal questions and address all of your concerns. To learn more about our firm and its services, contact us to schedule an initial consultation.